Globetrotting Texans! | Found My Kindred Friend in PEI Canada! Home Canada Found My Kindred Friend in PEI Canada! For my thirty-third birthday Trent surprised me with a trip to Prince Edward Island to visit the real home of the fictitious character, Anne, of Green Gables. When I say surprised that is exactly what I mean. He actually told me to pack for warm days, cooler nights and that was it! I had no idea where we were going until we had to transfer flights in Minneapolis, Minnesota. Or maybe we were in Detroit, Michigan, either way it wasn’t until we boarded the little puddle jumper that would finish the last few hundred miles into Charlottetown, Prince Edward Island, Canada. For those of you that may not be familiar, and to you I’m a little ashamed, Prince Edward Island is where all the magic of the book series by Lucy Maud Montgomery, Anne of Green Gables, takes place. If you were a farm girl like me, you can probably identify with long nights of nothing to do except read. Our house had two TV’s and no cable and so I was either on the phone or reading as a teenager. My favorite books were these found in this series. Then when the books were made into a mini-series for Canadian television, and shown on PBS in the states, my heart skipped a beat. I watched them with my friends, by myself, over and over trying to recreate the romantic relationship the main character, Anne Shirley has with her biggest rival and most handsome boy in town, Gilbert Blythe. I know I am embarrassing myself by letting you into by pathetic teen years by writing about this part of my life, but nonetheless I will continue. For my sixteenth birthday I woke with a crazy notion that dreams really do come true and a beautiful Jeep Wrangler, red with a plaid (customized) cloth top would be sitting in the driveway. (Yes this is truly the car I had made up in my head) But then I remembered I was the fourth of seven children, my dad was a teacher, and my mom was a homemaker. 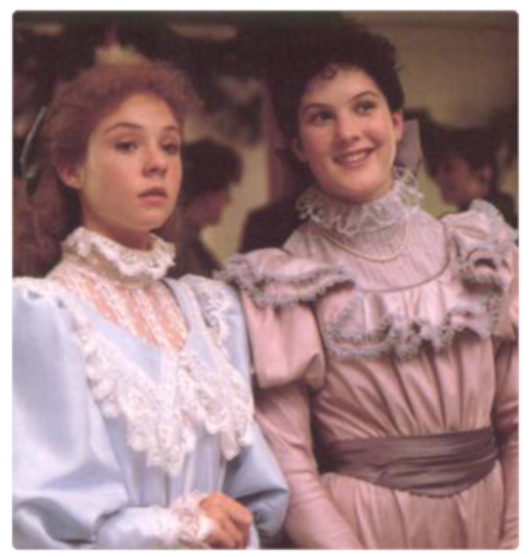 There were no funds for my Jeep Wrangler but my mom had bought me something special….two porcelain dolls that looked like the two “kindred spirits” or “bosom friends” Anne Shirley, and Diana Berry, from Anne of Green Gables. Funny thing… I still own these dolls to this day. They represent so much more to me now than just the two main characters from the books, but thats another story. Either way after reading these wonderful stories of love and loss, adventure and misadventure I was ready to go see where it all took place. 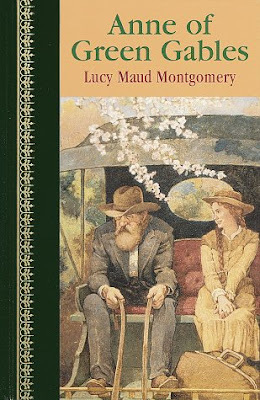 I should start by telling you a little about the author Lucy Maud Montgomery. L.M. 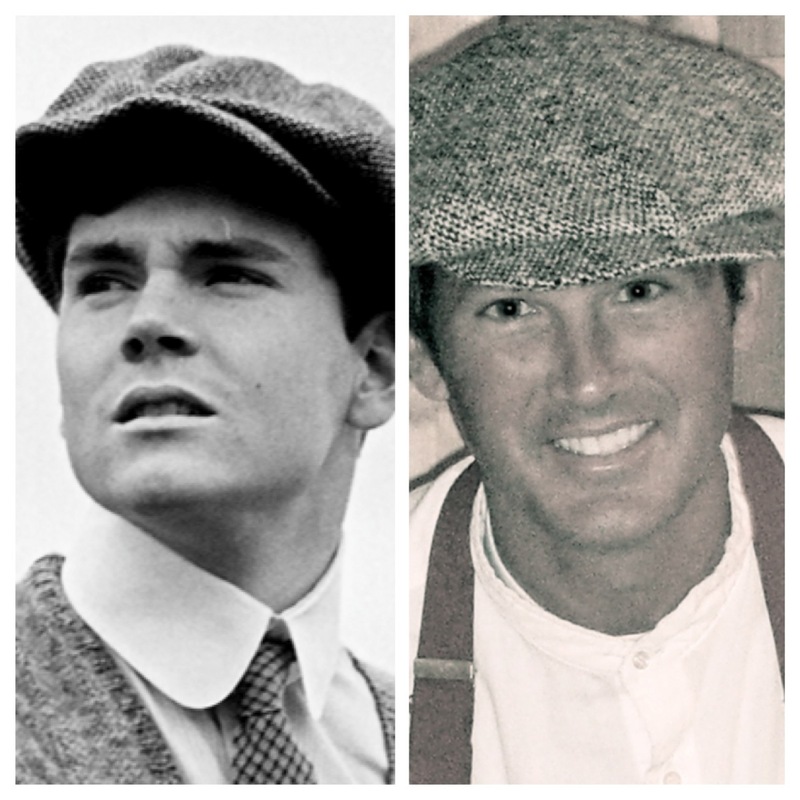 Montgomery was born in 1874 (exactly 100-years before me!) on Prince Edward Island. Her mother died and her father left her with her maternal grandparents to be raised in a strict household. Though she wasn’t quite an orphan like her character, Anne Shirley, she was very adventurous and had a great imagination. When she sent her book, Anne of Green Gables, off to be published in 1908 it was an immediate success and is now translated in many languages and has a world-wide following. The best part for me about the “Anne” books is the character is a self-reliant, poor, farm girl with lots of determination. (Ok I felt like I could relate a little 😉 However, the on again off again love affair with her arch rival, and best friend, Gilbert Blythe is what draws in any teenage girl long before Edward and Bella ever hit the written page. I may not look happy (in this pic) but I was thrilled to be there! I especially loved visiting the farmhouse that Montgomery based the character, Anne, in the books. There is a great little walking tour that you can take yourself and since it is the basis of a fictional book there aren’t any “real” items to see except to imagine Lucy Maud Montgomery visiting her cousins here as a child and creating Anne Shirley, and lending this farm house to her books, as Annes home. With so many sites that were created in the books like, Lover’s Lane, Haunted Wood or even Berry Pond aka Pond of Shimmering Waters it is fun to see on what she based these places. This farmhouse is very recognizable from the books and has a great display showing the life of Lucy Maud Montgomery. Just a short walk from the farmhouse is the site of the authors burial and it is lovely to see she was buried in a countryside that meant so much to her in this life. Besides the little sites to see representing this great little series of books, there is so much more to see in Prince Edward Island. If the snow didn’t run six feet deep in the winters I would gladly pack up my children and move to this beautiful island. The beaches are a beautiful red sand, and the fog in the mornings make for romantic walks on the beach. The rolling country side of green farming and patches creating a beautiful quilt of greenery makes this an enchanting place to visit. Trent and I enjoyed our drives along the country side almost as much as our walks along the beach. Even the sand dunes mentioned in the books are there for the readers imagination. It was so beautiful. I’ve also got to mention the food! I love seafood and this is a paradise for great fresh catch of the day type meals. The lobster dinner is so routine it is offered in almost all restaurants and it is the same in each; lobster tail, a potato, salad, a roll and a drink. Just say lobster dinner to anyone from this area and they know exactly what you’re looking for. Though I loved the lobster, Trent fell in love with the mussels, and just like the shrimp are served in any which way in Louisiana, that’s how they do the mussel’s in this part of Canada. Though there are many tours that are offered on different PEI websites I truly think that this is an island you can do yourself without a tour guide or group to follow. I can guarantee it will be cheaper to do it on your own as well. There are also lots of plays depicting the Anne books. The two I recommend are the Anne of Green Gables play that shows in Charlottetown all summer season and the Anne and Gilbert play that shows over in Summerside. Though I loved the Anne of Green Gable play it was exactly like the book and shows Anne in her youth. It is playful and fun but it wasn’t what attracted me to the books as a teenager. So in short if this is an experience that sounds attractive to you then fly into Charlottetown PEI, rent a car (very easy, just like renting in the US), stay up in Cavendish, see the sights both from the books and the real sights from the authors life, see the two plays, take a nice long morning walk on a beach, drive through the countryside and if you have time hike through Greenwich National PEI park. Make sure you eat in a recommended restaurant in Charlottetown, visit the shops in Charlottetown and check the summer calendar at www.tourismpei.ca to coordinate your trip to the time of summer you want to visit. If you are red-headed (that means you Cassie) then take a costume from the time period, put your hair in braids, and take some pictures with international tourists, and make a few tips to pay for your trip! Goodluck! Safe and Happy travels!! Okay, okay, you got me with this one. I’m not sure why I wasn’t invited on this trip but I can definitely go for a vacation where my hair will pay the bill. So jealous.